The Soyuz TMA-05M craft in which the astronauts traveled, seen here during pre-launch processing one week before lift-off. The Soyuz spacecraft that launched from Kazakhstan's Baikonur cosmodrome Sunday has successfully docked at the International Space Station more than 50 hours after liftoff, the Federal Space Agency said Tuesday. 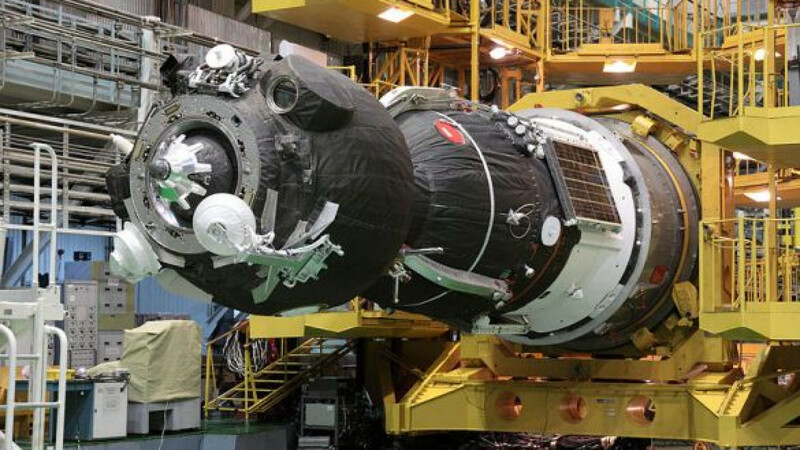 The hatches between the two craft, which docked at 8:51 a.m. Moscow time, took more than two hours to open as the crew made all the proper checks to ensure the vessels were properly sealed, Interfax reported. Newly arrived astronauts Yury Malenchenko of Russia, Sunita Williams of the U.S. and Japan's Akihito Hoshide will join the three already onboard for a welcoming ceremony with family and mission officials, then will undergo a safety briefing, NASA said in a statement on its website. The newcomers join commander Gennady Padalka and flight engineers Joe Acaba and Sergei Revin, on board since May 17. The six-member crew will conduct more than 30 experiments and execute a spacewalk to release a satellite as part of their mission. The docking marks the 37th anniversary of the first ever docking of American and Soviet spacecraft during the 1975 Apollo-Soyuz mission.